What is the Moda Love Sew Along? A social media sew-along using the Moda Love Pattern. When is it? January 24 is Moda’s official starting date for the sewing and sew-along. There will be introductory posts on Instagram, Facebook and Moda’s Cutting Table Blog on January 17th. Where can you join in the sew along? . At your local participating shop (come see us at Rocking Chair Quilts if you can get here). Don’t have a #modaloveshop near you? Join in online: search the hashtag #modalovequilt. on your social media. And on Moda’s social media. Why a Sew Along? Because sew-alongs are one of the best ways to make sewing-creating fun. Whether you like to create solo or with others. make your own sew along by meeting up with like minded quilters to create quilts and build the bonds of friendship. 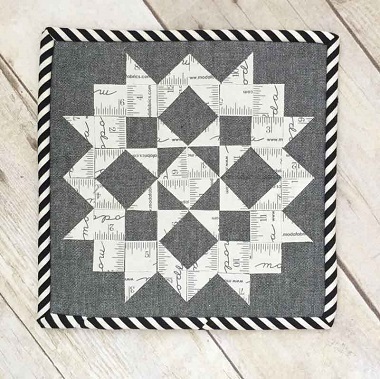 Why the Moda Love Quilt Sew Along? Because you can start with precuts, the Moda love quilt is fun and you will be done pretty quickly . Easy to sew together too - this pattern can be a great teaching quilt for those starting their journey through the quilting nation. We would LOVE to see what you will stitch together with the Love Quilt pattern! Whereever you share your love quilt projects, be sure and use the hashtag – #modalovequilt. To get your inspiration rolling here’s a gallery of grabs from the #modalovequilt hashtag. Quilts by #modamakers from around the world. Local Quilt Shop Day is a worldwide event designed to raise awareness of the importance of independent quilt shops to the local economy. It is a day for consumers and retailers to celebrate the creative pursuits of quilters, sewists, fabric enthusiasts, and crafters everywhere and to support the local quilt shops that make it all possible. This event, held annually on the fourth Saturday in January, will be held in 2019 on Saturday, January 26. THIS GIVEAWAY HAS ENDED, CONGRATULATIONS TO cAROL yATES! THANKS SO MUCH TO ALL WHO ENTERED, BE SURE TO LIKE US ON FACEBOOK AND SUBSCRIBE TO THIS BLOG SO YOU WILL KNOW WHEN THE NEXT GIVEAWAY BEGINS. We've had a fairly mild winter here, were we work and live at Rocking Chair Quilts. Not bitterly cold. nor a great deal of snowfall, but I must say that the sunny days have been few and far between this season. To brighten our moods and celebrate the sunny days that we do get to enjoy, we are hosting this giveaway of a BRIGHT bundle of Moda Fiji Batiks and AURIFIL threads. Soon we'll be enjoying the early Spring and all the sunshine that those days will bring. 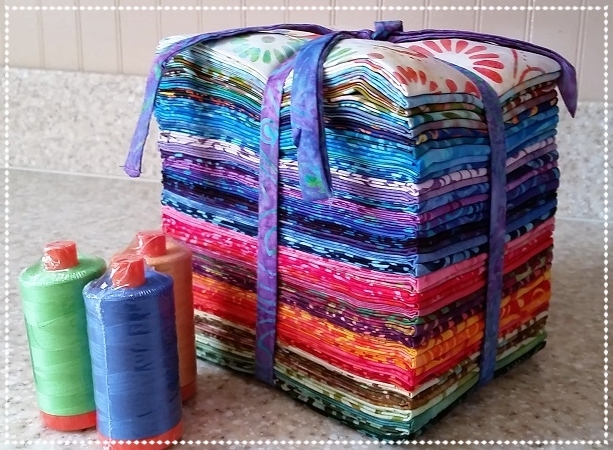 While we wait for those bright days ahead, what could be better than busting open this colorful bundle and starting a cheerful quilt (or two) ? Leave a comment on this blog post to enter for a chance to win this prize . You can submit even MORE entries when you use the Raffle-copter widget (click inside the white box below). This giveaway ends Friday, February 10th at 11:59 p.m. CST. Why do we sew and quilt? There are probably a lot of good answers to that question. My first response would certainly be " I LOVE IT!" I really do; all parts of the process- the planning, the choosing, the buying, the cutting, the stitching, it seems I never get tired of it. The excitement and joy never wane. As I get older I have realized that one of the most satisfying things about making something with your hands happens when you give what you made to someone else. We were honored last week when Paula Moore paid a visit to our little quilt shop. Paula is the regional manager for Ryan's Case for Smiles. She came in to ask if our shop could be an official drop off spot for the organization. It only took a minute to agree. Working together we can all help seriously ill kids feel better so they can heal better. Who/What is a Case for Smiles? Ryan’s Case for Smiles (formerly ConKerr Cancer) was founded in 2007 to bring comfort and support to young patients and their families in hospitals around the globe. We started with a simple goal: to create and distribute whimsical pillowcases that give children an emotional boost and remind them that they are not defined by their illness. Today, our programs have expanded to include the children’s entire families so they can better navigate and cope with a very difficult experience and avoid long term emotional trauma. What kind of fabric can I use to sew pillowcases? Fabric needs to be 100% cotton. Please do not use fabric with glitter. Remember to use fun, colorful novelty prints! Check with local coordinator for local hospitals specific requirements. For example: some hospitals do not allow flannel and red pillowcases tend to bleed. Some hospitals also do not accept holiday themed pillowcases. Ryan's Case for Smiles does not accept ‘No-sew pillowcases’. See PDF Guide for full list of guidelines. How do I wash the pillowcases? Rocking Chair Quilts is now an official drop off center for your pillowcases. See the map at the bottom of this blog post to find us. If you are not close by, CLICK HERE to find a another drop off center that is closer to where you are. All donations are tax-deductible. RCFS is a registered 501 (c) (3) organization. When you drop off a donation, include a note stating what you donated and what the value is. Be sure to include your full name and mailing address. Then in January of next year, you will receive a tax letter directly from RFCS home office in Pennsylvania to be used for your tax return. Have more questions? There is SO much more info for you at Ryan's Case for Smiles website. Stop by the quilt shop and pick up printed information that Ryan's Case for Smiles has provided. Donate: fabric, funds or your time. These volunteers took their sewing skills to the great outdoors for this "Campground Sew-A-Thon"
Use the Map to find us . Click on the red map pin for directions. Click and scroll to zoom in and out.